Although the good folks at Drawn already posted about Gary Taxali's show the other day, I'm so excited about it I thought I'd post about it too. I was recently shopping in Lawrence, Kansas at one of my favorite stores, when I saw a new display of cool stuff from Blue Q. Not only was there a great little coin purse done by Ray Fenwick, but there was also a super fun reusable grocery bag by Gary Taxali. I ended up walking out of there with both items (ha!) and when we got home and I was looking at my new gems, I began thinking about how cool it is to see this kind of art work on stuff like this. Blue Q has always done lots of cool products with all sorts of great artwork on them, but lately there seems to be an explosion of it. I love it. More and more artists are also getting into the practice of selling limited edition giclée prints, and Gary Taxali is no exception. 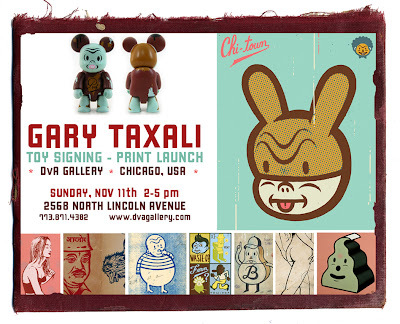 For a preview of the show, check out Gary Taxali's page on DvA's website.